On September 3, 1978, I was released from jail in Kabul, Afghanistan. On the way out, they handed me my camera, which had been taken from me three months earlier. Surprisingly, there was still live film in the camera. I was able secretly to snap this shot as I was being led down the corridors of the jail. The two men in the photo are my fellow prisoners. 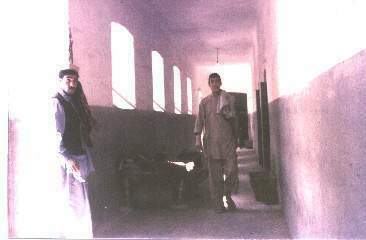 This is a rare photo from inside an Afghan Jail. For another view of the same jail, see: Leaving the Central Jail in Kabul . Here is how I escaped from jail in Afghanistan. My Escape from Jail in Afghanistan . For the History of the War in Afghanistan, see: A Brief History of the War In Afghanistan. For a photo of one of my fellow prisoners from an Afghan jail, see: Syed Durali Shah Naqwi . Gunmen Kill Relative of Slain Afghan President Najibullah .